The moving average is a widely used trend following indicator. It can be easily evaluated and tested and thus it is considered as the foundation for many trend following forex trading robots. However, as a trend following indicator, it lags the market action. It keeps track of trend once it progresses but it will not predict trend reveresal. In contrast, candlestick analysis could come handy in market forecasting purpose. In mathematics, the average also known as the simple moving average or the arithmetic mean or simply mean measures the central tendency of a set of data. For example: Consider calculating moving averages of 7 days. Since closing prices are the most preferred data in technical analysis, we will stick with closing prices. In the first example, we simply calculate average of first seven set of data and divide by 7 to arrive at 11 as the first day 7-day average. When calculating successive values, a new value comes into the sum and an old value drops out. As the closing price becomes available on next day, we compute second day average in the same way as we computed the first day average but we drop the first day data 8 and added new data 15. Similarly, on the third day, we drop 9 and add 16 to arrive at the third day 7-day average as 12. So in this example, as the price progresses with time, so does averages. Daily closing prices in our above example moved from 8 to 16. Likewise averages moved from 11 to 13. Hence this average is named moving averages as it moves along with price movement. Also notice, that averages is always less than the last closing price of that day. The first day 7-day average 11 is less than the last closing price 14. Similalry, second day 7-day average and thrid day 7-day averages 12 and 13 are less than the last closing price of 15 and 16 respectively. Thus moving average is called lagging trend following indicator. The only periods covered by SMA is taken into consideration. For example, in the 7-day moving average, only the periods of seven day is considered. So many believes that the SMA misses significant past information beyond seven day which otherwise should have been taken into consideration as well. The SMA assigns equal weight to each periods covered. For example, in the case of 7-day moving average, each seven day's close price recieve same weight. Though each day's close price is significant in order to calculate 7-day SMA, many also think that the recent close price should bear more weight than the past data. In other words, the close price on day one should bear less weight and the day seven close price should bear more weight as recent data is more significant. Also known as the linearly weighted moving average or simply WMA addresses one of the criticism of the simple moving average (SMA). It introduces multiplying factors to assign different weights to data at different positions during the sample window. In the calculation of 7-day WMA, the first day close price is multiplied by 1, the second day by 2 and so on... to the seventh day close price multiplied by 7. Then the sum of it is divided by the multiplier =(1+2+3+4+5+6+7) to arrive at WMA value. In this process, the first day close price gets less weight whereas the last seventh day or the recent close price gets greater weight. For example: Consider calculating the 7-day linearly weighted moving averages and compare with the 7-day simple moving averages. So the WMA is greater than SMA for the same period in above example. Hence, WMA reduces the lag in the SMA by applying more weight to the recent close prices. However the linearly weighted moving average (WMA) still does not address concern regarding the criticism that the only periods covered by WMA itself is taken into consideration. Also known as the exponentially smoothed moving average, exponentially weighted moving average or simply EMA, addresses both of the criticism of the simple moving average. It includes all the data in the life span of the instrument being examined. It also assigns greater weight to the more recent data. α is the smoothing factor. where N = Number of periods. For the first calculation of EMA, the simple moving average is used instead of EMA_yesterday since the EMA has to have a starting point. We need three pieces of information in order to calculate EMA. First, let's calculate 7-day SMA since we will need to use it in place of EMA_yesterday for the first calculation of EMA. This implies that for a 7-day period EMA applies a 25% weighting to the most recent price. In our day to day trading life, implementing moving averages on chart or candlestick analysis is just as easy as a click of button. Thanks to revolution in forex trading systems more and more technical indicators are available to just any traders at any level. The moving averages could be applied to generate buy and sell signal. I will mostly discuss signal generation using moving averages in conjunction with candlestick chart. Using the simple moving average a buy signal is generated when the bullish full bodied candlestick close above the SMA line. A sell signal is generated when the bearish full bodied candlestick close below the SMA line. Applying a single moving average to generate signal has its own limitations. It needs fine tunning at the mercy of expert traders to generate consistent and profitable signal. For example, a shorter period averages like 5 or 10-day SMA generates more signals as they are more sensitive to price fluctuation. They often generate more noise or premature signals as well. On the other hand, a longer period averages like 50 or 100-day SMA generates less signals and are more reliable when trend is intact. They do a good job in filtering out noise, however, are worthless during trend reveresals. 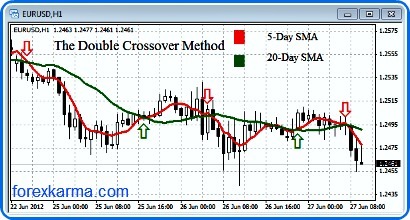 The double crossover method apply two moving averages to generate a signal. In this process a shorter and longer averages are combined to get a result that is sensitive enough to produce early signals whereas insensitive enough to avoid random noise in the market. Some of the most popular combinations are 5-day and 20-day averages and 10-day and 50-day averages. For example, using 5-day and 20-day averages, a buy signal is generated when 5-day SMA crosses above the 20-day SMA. A sell signal is generated when 5-day averages crosess below the 20-day SMA. 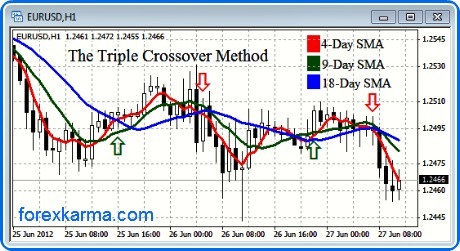 The triple crossover method apply three moving averages to generate a signal. The widely popular combination is a 4-9-18 moving averages combination. The other popular combination is a 5-10-20 moving averages combination. In applying three moving averages in combination, the shortest period is the most sensitive and follows the trend very closely. For example, in applying 4-9-18 day moving averages, the 4-day will follow the trend closely followed by 9-day and 18-day. So the proper alignment in any case to generate a valid signal would be 4-day SMA followed by 9-day and 18-day SMA. In a downtrend, a buy signal is generated when the 4-day SMA crosses above the 9-day SMA, which is above the 18-day SMA. In an uptrend, a sell signal is generated when the 4-day SMA crosses below the 9-day SMA, which is below the 18-day SMA.